Jurgen Koch at Fraser Yachts in Palma send news of a €250,000 price cut on his central listing, the 22.5m motor yacht Holnis. The classic lines, elegant teak interior and panelling throughout give her a warm and welcoming feeling. Accommodating six guests in a master suite and two twin cabins, Holnis has twin Cummins 240hp engines giving her a range of 2,000 nautical miles at her cruising speed of 9 knots. 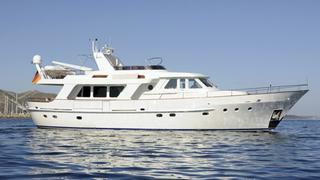 Lying in Bodrum, Turkey, the asking price of Holnis is down from €1.45 million to €1.2 million.